Curse of the Thirteenth Fey: The True Tale of Sleeping Beauty by Jane Yolen. Review: Faeries, fey, shouting, and family all bind themselves together to make Curse of the Thirteenth Fey written by Jane Yolen. If you like the original tale of Sleeping Beauty, then this book is a definite must-read book for you. Gorse is the thirteenth child in a Shouting Fey family. Follow Gorse's crazy wild ride as she discovers lies, secrets, information, and maybe even herself. Gorse has always had a hard life growing up in her family, being the thirteenth child, because the great aunts and her mother had a hunch that she was the 'one' in all of Shouting Fey history. The Shouting Fey, have been bound to the land until a curse is broken, and only then will they be able to go wherever they want. Shouting Fey has the ability to shout out a riddle or scream and they're predator would be curse or injured by the shout. They also have wings to fly. Since she is the thirteenth child in the family, the family easily gives up their beliefs of Gorse being the one to break the curse because she would often have nightmares or get sick throughout her short childhood. Gorse is very unique. Instead of frolicking in the meadow wearing a pink frilly dress like other girls, she chooses to read in the library with her elf father. She has a special connection with her father that no one could ever break. When Gorse is very shaken by a cold, she has to stay in bed while her entire family attends Princess Talia's christening. Gorse, feeling better, decides to go on her own, and while walking along the Wooing Path, she falls into a hole, that changes her life forever. Will anyone be able to break the spell? Is Gorse really the 'one'? Read and find out! Because I enjoy the Disney version of Sleeping Beauty, I found Curse of the Thirteenth Fey to be somewhat boring. I was confused for a large amount of time while reading which did not allow me to fully enjoy the story. I loved the idea of another Sleeping Beauty, but was disappointed in the turnout of the book. However, I also think that my opinion is somewhat biased since I generally do not enjoy fairytales. That being said, Jane Yolen clearly has a talent for writing old-fashioned princess books, so I do encourage you to read her other books, but you could pass this one up. Gorse's adventures in the book are what kept me from closing the book and placing it back on the shelf. Her adventures are fun and exciting but also kept me guessing and helped me to continue on throughout the book. I feel that anyone over the age of en could read this book because they're no cuss words in the book but the writing is often hard to understand. Both genders would enjoy the book as well, but most girls would probably relate to the characters and like the book more. I only give this book two and a half stars for the overall lack of excitement in the plot, but the redeeming factors are the intellectual and relatable characters and writing. 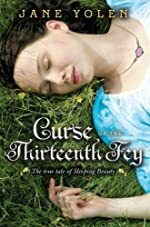 In the end, unless you are a person who loves fairytales and would not be swayed by the Disney version, Curse of the Thirteenth Fey is a book you can definitely skip over when trying to find a new book to read. We would like to thank Raab Associates for providing a copy of Curse of the Thirteenth Fey: The True Tale of Sleeping Beauty for this review. Have you read Curse of the Thirteenth Fey: The True Tale of Sleeping Beauty? How would you rate it?